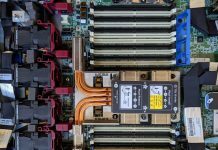 Recently Patrick asked me to configure a Lenovo ThinkSystem SR650 2U Intel Xeon Scalable platform as part of our review process. We are going to publish our review in the next few weeks. 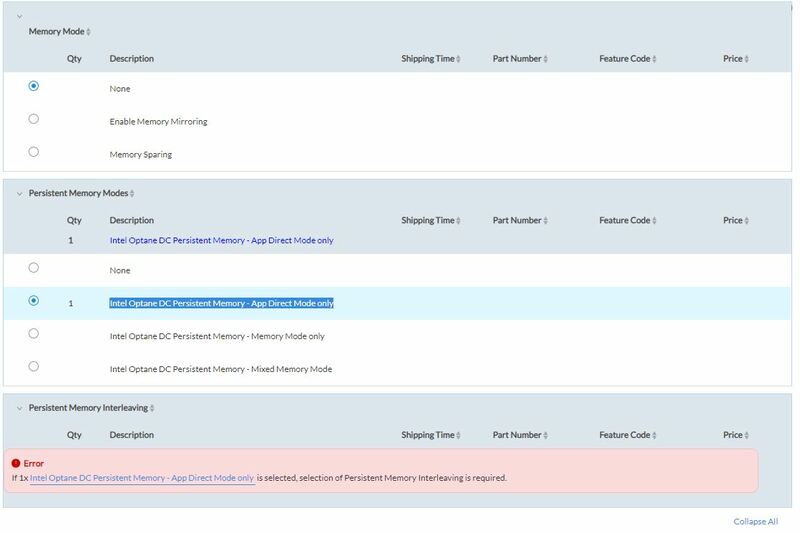 During the process, I found a curious option to select Intel Optane DC Persistent Memory. This was surely a configurator error allowing me to select the option on 13 November 2018 through 14 November 2018. It also showed us more detail on Intel Optane DC Persistent Memory population. We expect to get more details as Cascade Lake-SP and Cascade Lake-AP finally launch. Lenovo also is showing a 1.2V label on the Optane Persistent Memory modules which matches current DDR4 expectations. Intel had not confirmed this 1.2V operation publicly, with some speculating it would run at higher voltage. It seems like Lenovo has made this disclosure along with its branding for OPM and the modes which it can operate in. One can see that in App Direct mode, the Lenovo configurator is asking for Persistent Memory Interleaving. We then tried a few configurations to see what the configurator rules are. I spoke to Patrick, our Editor-in-Chief, who has a background in configuration and pricing tools, and he said that configurators are rules engines. Companies define sets of rules that allow users to build valid configurations for ordering. By selecting Intel Optane DC Persistent Memory and not being able to select the modules, the configurator detects an invalid configuration. Like most good configurators, Lenovo then prompts the user with an error message and actions to remedy the message. It just so happens, that the Lenovo configurator is giving these error messages for proper configurations using parts that are still not released for the public. 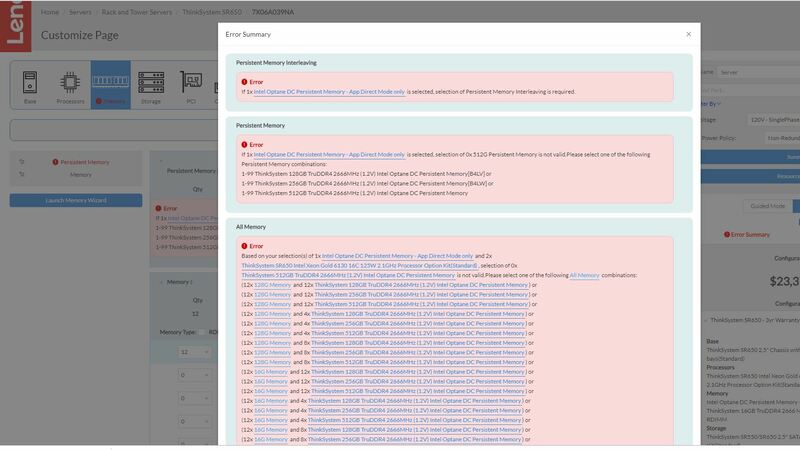 For our purposes, these error rules show how Intel and Lenovo are building their valid configuration rule sets. We can validate that Lenovo is listing 128GB, 256GB, and 512GB configurations as we covered in Intel Optane DC Persistent Memory Sampling Today Revenue Delivery 2018. It is also showing a 128GB x 12 DRAM plus 512GB x 12 OPM 3.84TB configuration per socket which matches the Intel company photos, disclosures, and what we have seen from other vendors. Here is a link to the Lenovo configurator. Not all configuration options for the ThinkSystem SR650 have this option, however, the ThinkSystem SR650 pre-configured system with the Intel Xeon Gold 6150 still has the OPM configuration options. 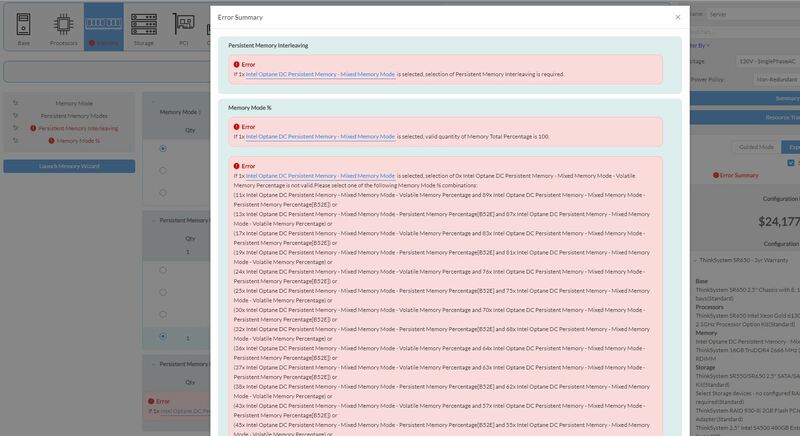 For those that are interested, we are going to copy/ paste some of these error messages on the next page. The Lenovo configurator seems to allow up to 12x TruDDR4 RAM modules alongside up to 12x TruDDR4 Intel Optane Persistent memory modules. 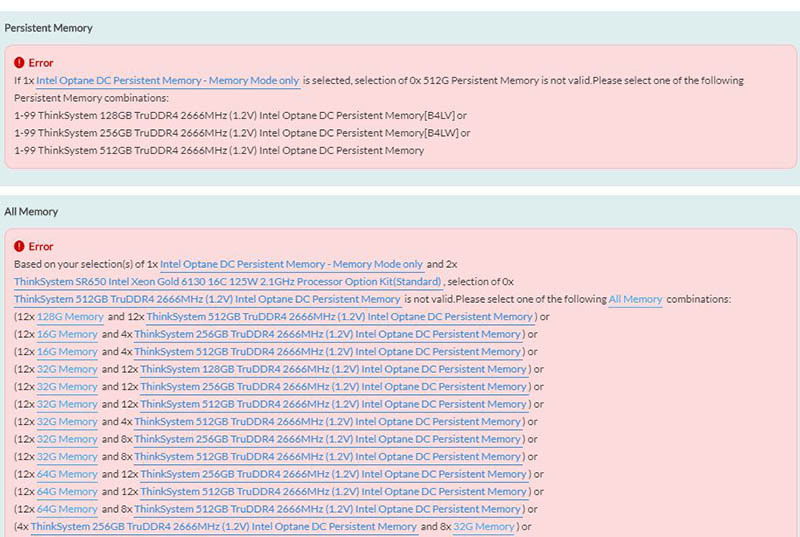 When you delay a product as much as Intel has delayed Optane Persistent Memory, this sort of thing happens, and it is a bit of dumb luck that the configuration STH is reviewing has this showing on the Lenovo configurator. Did you really have to speak to Patrick to figure that out?